See the best 10 photos from today. A man's umbrella blows inside-out as he walks along downtown Salt Lake City on Dec. 14, 2015. The first major winter storm of the season dumped up to a foot of snow in some parts of the Salt Lake City metro area, snarling traffic on morning commutes to work and school. Lawmakers react as opposition lawmakers released tear gas canisters to disrupting a parliamentary session in Kosovo's capital Pristina on Monday. The tear gas in Kosovo’s parliament is their latest attempt to pressure the government into renouncing deals with Serbia and Montenegro. Clouds of smoke at the debating chamber released from two smuggled tear gas canisters forced lawmakers out of parliament Monday, something the opposition has successfully achieved since mid-September also using pepper spray, whistles and water bottles. Abu Mohammed, covered with dust from explosions, walks in his home following reported air strikes by regime forces on the Syrian town of al-Nashabiyah in the eastern Ghouta region, a rebel stronghold east of the capital Damascus on Monday. A giant Christmas tree burns outside the the Westin South Coast Plaza hotel in Costa Mesa, Calif. on Monday. The cause of the fire, which destroyed the 96-foot-tall Christmas tree, is under investigation. Republican presidential hopeful Donald Trump appears an electronic display announcing the upcoming Republican presidential debate on the Las Vegas Strip on Monday. Pro-Houthi armed tribesmen hold weapons aloft and shout anti-Saudi slogans during a tribal gathering to show support to the Houthi rebels in Sana’a, Yemen on Monday. A new round of peace talks between warring sides in Yemen will start in Geneva on December 15, amid reports of a planned ceasefire by midnight December 14. Saudi Arabia and fellow Sunni partners, including the UAE, have since March been carrying out a military campaign in Yemen against the Iranian-allied Houthis, who are fighting to oust internationally recognized President Abdo Rabbo Mansour Hadi. Israeli police patrol next to the scene in Jerusalem where a motorist rammed into a bus stop, injuring at least nine people before he was shot dead on Monday. The Benjamin Franklin Bridge is shrouded in fog on the Delaware River in Philadelphia on Monday. Dense fog following a weekend of record-breaking temperatures slowed the commute in parts of Pennsylvania. 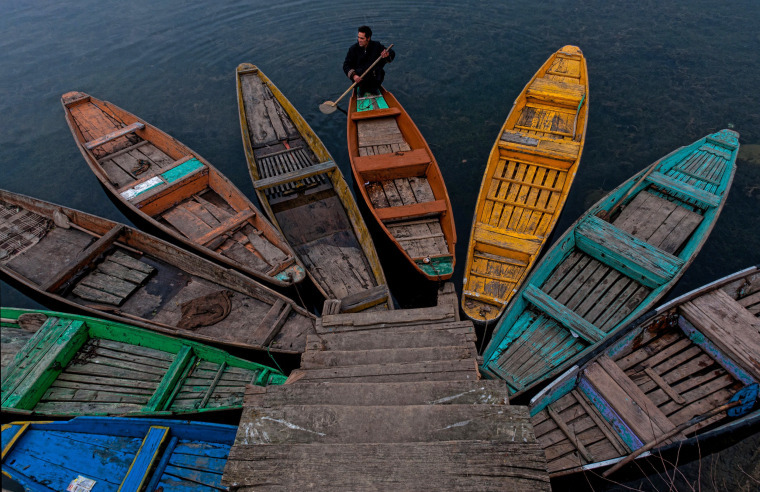 A boatman rows his boat on the Dal Lake in Srinagar, the summer capital of Indian-administered Kashmir, India on Monday. Kashmir has been a contested land between nuclear neighbors India and Pakistan since 1947, the year both the countries attained freedom from the British rule. A giant illuminated Santa Claus stands on the Promenade Des Anglais in Nice, France on Monday.